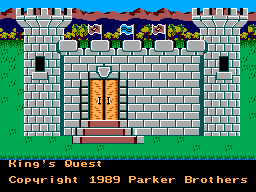 King's Quest - Quest for the Crown is a very historically important game. When it came out in 1984 on the PC it was hugely popular because it was the first graphically animated adventure. This game alone spawned dozens of "true" adventure games like it giving rise to the golden era of adventure gaming. It is important not to confuse this game genre with action/adventure. There is some action but it is minimal and does not recquire skill or reflexes. Completing the game relies on the ability to solve puzzles through lateral and logical thinking. I think the original KQ has really excellent gameplay on the PC, you can just keep wondering around for ages trying to work things out (console or non-adventure gamers may not agree with that statement because they are to impatient to play adventure games). So therefore it's logical to assume that the Master System version would be as playable but this is not the case. Unfortunately this port of the game is crippled by the removal of a feature fundamental to it's gameplay. In KQ it's very easy die and it happens a lot, not only that but there are a few choices you can make which will prevent you from being able to complete it. So therefore you can understand why a save game is very important feature. In this version it has been replaced with a password feature so each time you restart you have to enter a long password which you hopefully remembered to write down earlier. Apart from that very fatal flaw though you still are left with a very good port of King's Quest. As long as you have the patience to keep re-entering passwords this game will keep you constantly wandering the grassy screens busting your brain until you figure out what to do next. Although it won't keep you as occupied as the PC or Amiga version because you select commands instead of typing them in which makes less possible actions to try. Because it was released a whole 5 years afer the original, the graphics were vastly improved from the original 16 colour EGA PC version. The edges of sprites, objects, backgrounds, etc is non-pixelated and the range of colours available on the SMS's palette makes it very easy on the eyes. Only a small range of animations are in this game they are not so great but more detailed than the original. 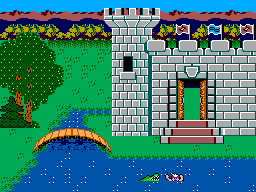 In all I think the graphics are very good for the Master System but nothing overly special although they are far superior to the original version in most, if not, all ways. Not a lot to write about here. There is no music besides short tunes which are more likes sounds then music. Sound is very minimal, you won't hear any until you figure out something or go to a certain screen. The sounds and music basically just replicate the sound in the original version which was mainly beeps generated by the PC's internal speaker. The sound and music are poor but you can't really expect much for this game. The keyboard typing box in the computer versions has been replaced with 2 small interfaces which is activated when you press the buttons. One of the buttons brings up a list of general commands such as "look about" and option commands such as "status" which shows points and inventory. The second interface is the one used the most as it has a list of commands and items which are used to interact with the environment. Overall I think this system is a fairly good way of replacing the keyboard typing box. It makes commands easy to find and select, the only problem is the accept and confirm buttons change depending on which interface you are using. Also the player moves a little slow but apart from that the controls are adequate. Very little replay value, however that is not unusual for an adventure game. Once you finish it you basically have seen everything the game has to offer. Although at the end you may try to figure out extra things to obtain all the points (~150), it's unlikely you would want to play it again in the near future ... unless you get amnesia and forget all the solutions. 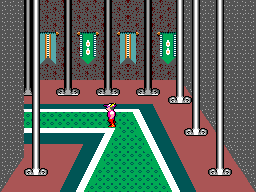 The NES's large library meant that it received a few adventures, most of them really involved and very sophiscated in comparison to the SMS's only adventure - KQ. It's a shame as this would of meant, at the time, adventure gamers would have to get a Nintendo in order to have any selection available at all. Although Sega had starved it's MS owners of nearly all adventure games it fortunately has King's Quest released and therefore preserved the original and most classic adventure in it's game library forever! If you are an adventure gamer and you own an SMS than you must play this game!